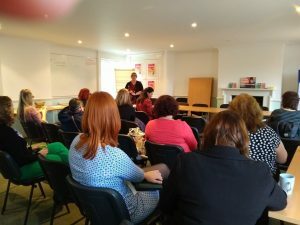 The 100 Women First Project was launched on December 13th 2018. This was the dream of Caroline Derrick, such an inspirational women, mentor, manager and so much more. I truly believe she can make anything happen. It was the Saturday before the launch, months and months of hard work to make Caroline’s dream become a reality and we were finally ready. All the posters had been distributed to local venues, cafés, partner’s organisations; it had been promoted in every meeting humanly possible and even sneakily photographed in Twitter posts! I suddenly get a message to say Caroline has fallen and hurt her knee and is off to A&E….OMG….please let everything be ok.
Caroline had fractured her knee and had to wait for an appointment at the fracture clinic, she couldn’t bend her leg, let alone walk to or even get to work…..Then it hit me…..the 100 Women First project launch! I hesitantly returned to work on Monday morning still praying that all will be fine, however it became apparent that it wasn’t. I needed to inform our Partners on this project explaining what had happened – the main Women behind the project (Caroline) was unable to attend. I felt devastated, as I knew Caroline would be gutted to miss the launch. Everyone was fantastic; extended reinforcement was offered, especially from my team here at Sedgemoor. I felt an enormous sense of comradery that I hadn’t experienced for such a long time. I’d almost forgotten what being part of a team had felt like. 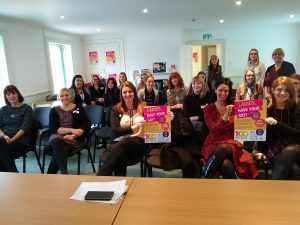 The 100 Woman First Project had drawn enormous interest from lots of providers. People from different organisations attended to give their support desperate to get involved with this unique project whilst local Sedgemoor women were intrigued by all the advertisements. The launch was a huge success with the help of our project Partners SS&L and Sicga. 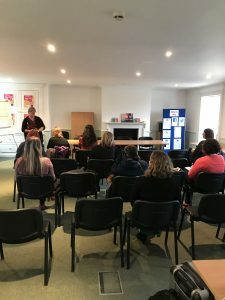 It was overwhelming to see how vulnerable and isolated some of Sedgemoor women are but even more so – to discover just how women pull together and support one another in difficult times. The 100 Women project couldn’t have come at a better time. We are now into January and Caroline has returned to work and met some of the original 100 women from the launch. We have held drop in session throughout January and will continue into February, and have already a good cohort of Ladies. Caroline was even able to secure some job interviews with the new Holiday Inn Express Hotel soon to open on J24 and we were told after the interviews that two of our 100 Women will be receiving Job offers! What a fantastic result in such a short period. Another of our women, who was signposted to Business Start-up advice on the day of the launch, has now started her very own company! The successes do not stop there. One Lady has already attended an anxiety workshop and others have enrolled onto the Positive People Programme. This is such a humbling job role I love what I do and get enormous pleasure out of helping people to better and believe in themselves allowing them to feel a sense of self-worth again. Exciting times are ahead and this is just one project, but one very special project that will really make a difference to the women of Sedgemoor and their families. I will keep you updated on its progress.